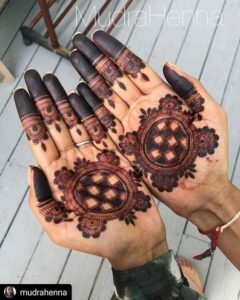 Mehndi is derived from the Sanskrit word mendhika. 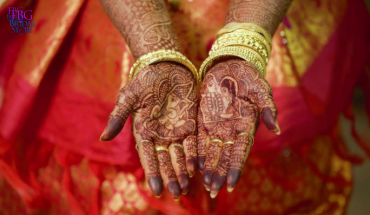 Mehendi is considered to be one of the most important parts in Hindu Vedic rituals book. 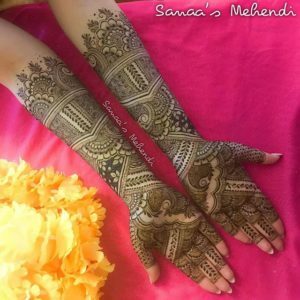 Generally, Mehendi is prepared in a paste form and applied in the hands and feet in different designs. 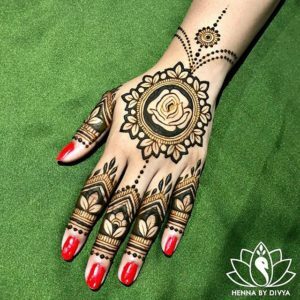 As applying henna gives positive vibes and good fortune, it is most commonly preferred in all festivals and occasions like Eid, Diwali, Bhai Dooj, Weddings. 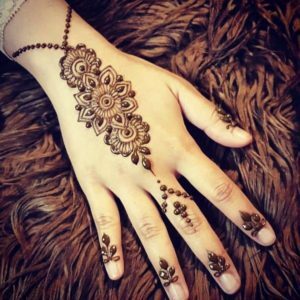 As applying mehndi is more common nowadays, girls want to try out their own Mehndi designs for hands and feet. 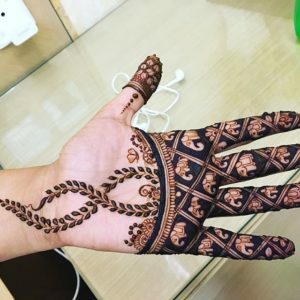 So, in this article, we have collected some handfull latest collections of simple mehndi designs that you can try out on your own. 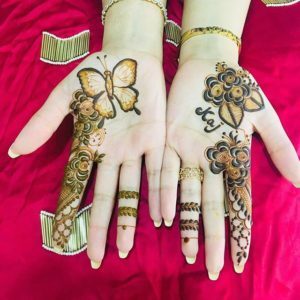 This elegant butterfly mehendi design is one of the latest artwork which perfectly suits for brides who wants to strike for a simple as well as modern design. Though the design flows through one finger of the palm, the prominent empty spaces further add beauty to the designs. Though the design looks complicated with a closet of flower and leaves design, it is much easier when you give it out a trial. 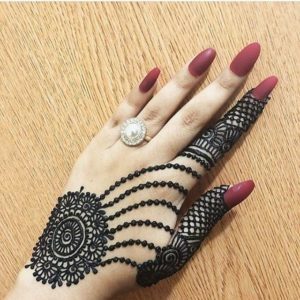 If you are looking for a simple bridal mehendi design for hands then you can try out this style. We girls never say no to jhumki at any cause, as we all love to wear it. If you are looking for a different design other than floral and leaf motifs then you can try out this jhumki design. The natural hanging design of the jhumkas adds beauty to the art. Go for a combination of designs like circles and checkers in a simple way. Cover the patterns with filler designs of your choice to make it look prettier. 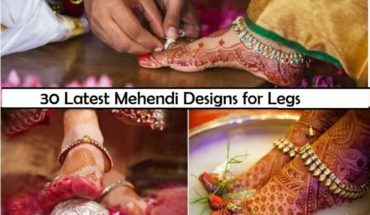 There are different styles of proposing your love but this time why not through mehendi! 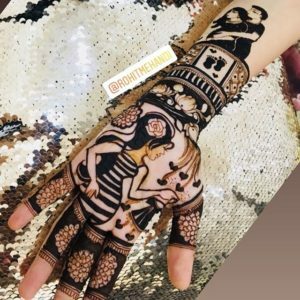 yes, make your proposal through henna art. If you are an artist at any cause than figuring out face structure would be much easier. 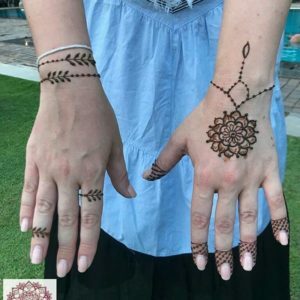 Going for a trails designs in the backhand, but this design is something different there are many combinations with detailed design pattern with floral, mango motifs in the front hand. 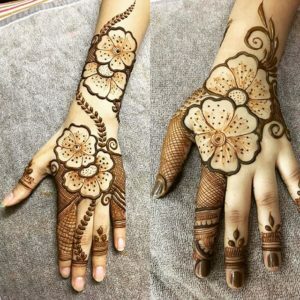 If you are a flower lover then you can try out this design, where floral motifs play a vital role and leaf stem acts as connectors in between. 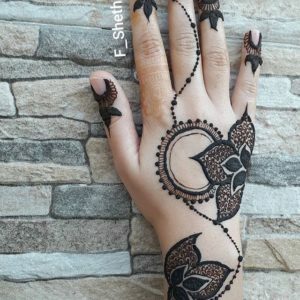 This simple mehndi design with floral motifs with simple circular design connected with dots is a great option for western outfits. This design is a perfect choice for bridesmaids which resembles like a girl is clicking a picture of the couple. More dramatic though! 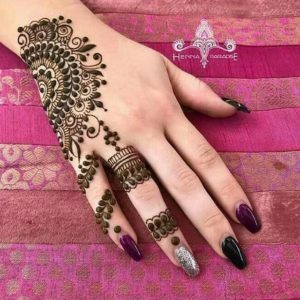 This single finger minimal mehndi design is one best choice for the simpler outlook. 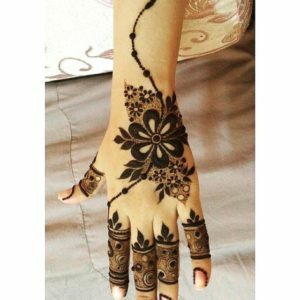 Make a simple mehendi design like the picture below. Draw out three floral designs at the backhand and design it with dots like a chain. 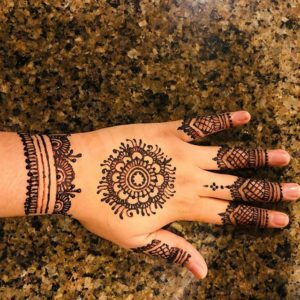 Looking for a simple mehendi design for your baby shower? Then this design is the right choice. Portrait your love for the baby in the design too. Being a bride is one of the best feelings for a lifetime. 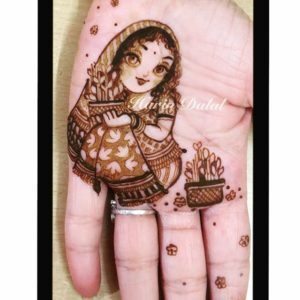 Portrait this in your mehendi art with bride and groom impression in a simpler way. 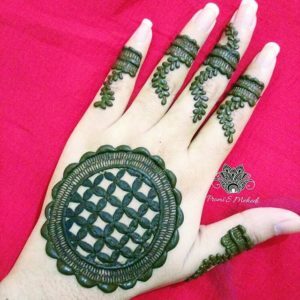 This mehendi design is with layers of circular strokes will be a great option for beginners. 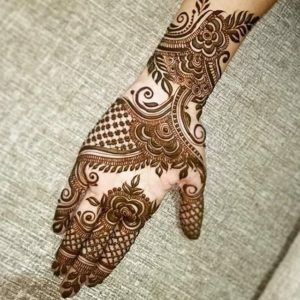 This is another type of simple mehendi design with minimal design patterns with circles and leaf motifs. This simple and classy design with simple pattern works. The bold floral in this mehendi designs are thicker than usual floral types. 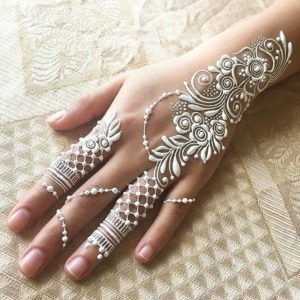 This design pattern gives an immense beauty to the entire hand. 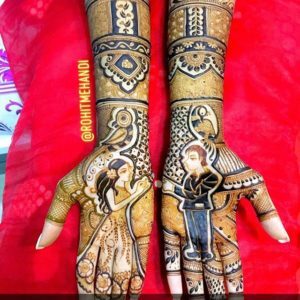 This mehendi design is to show the love between mother and child. 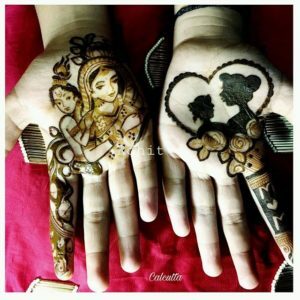 The mehendi portraits Lord Krishna and Yashoda and the other hand portraits Silhouette of a little daughter and mother which is something very innovative and beautiful. 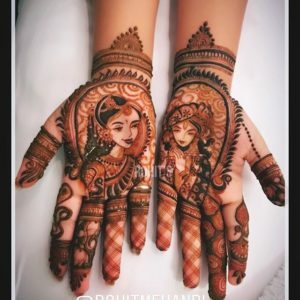 Are you all aware of white mehendi! 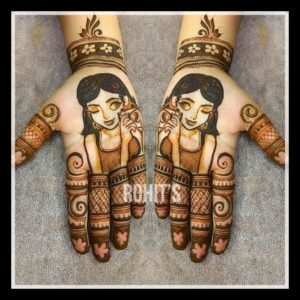 this is one of the trending henna art in recent times. Try it out this style. Make your mehendi little innovative with this parrot and floral design patterns. 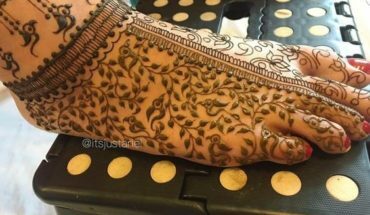 This mehendi design with lotus motif is one of the best options for beginners to try it out easily. 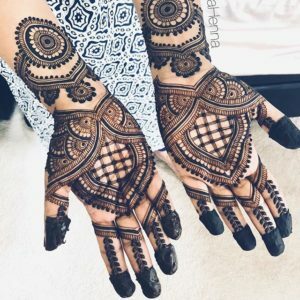 This geometric design in the backhand is very unique and simple with checker design in a circle pattern. 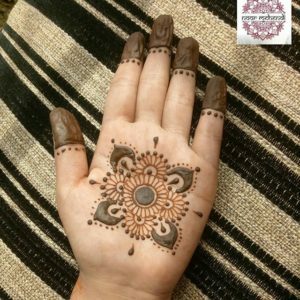 This minimal mehendi celebration with center floral pattern is the best choice for kids. 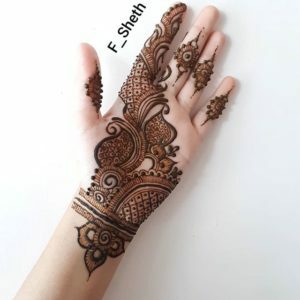 A cute and simple mehendi design is the best pattern work for kids for party wear. 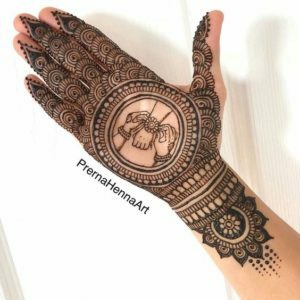 Though this simple mehendi design as a minimal artwork in it, the elephant motifs enhance the beauty of the design work. 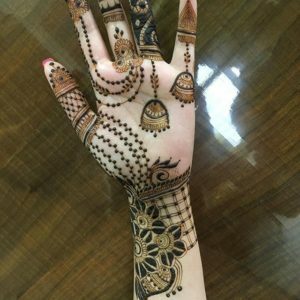 If you are looking for a special mehendi design for Gauri Vrat then this is the best choice to portrait the beauty of the occasion. 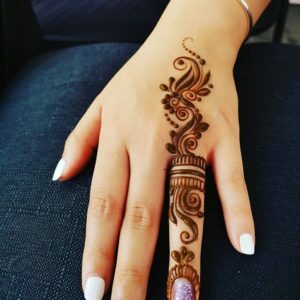 This mehendi design portraits a Rakhi tieing spot which is ensembles in a circular ring. The bold floral motifs with dotted stroke flowing in one finger add beauty to the hand. 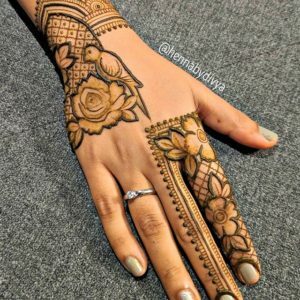 This mehendi design looks more stylish and classy in its own way. Though some of the design looks little difficult, you can crack the design pattern with practice. 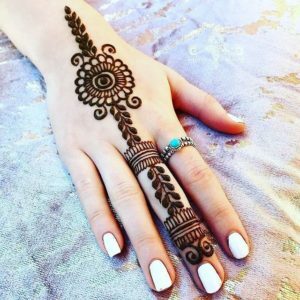 So, try out this simple mehendi design and comment your favorite one below. 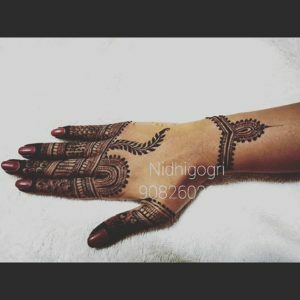 Why TBG Artists are the Best Mehendi Artist for South Indian Brides?